Treat yourself to some new gear for the new year. We have uploaded a new shirt design to our store. The microfiber shirt is great as a base layer on your next adventure. Beware the sizing instructions though. I am a 42″ chest and a medium fits just fine. “If you’ve been missing your favorite motorcycle travel mag, fret no more. We’re proud to announce the return of Motorcycle Escape, in limited release for 2010 and 2011. 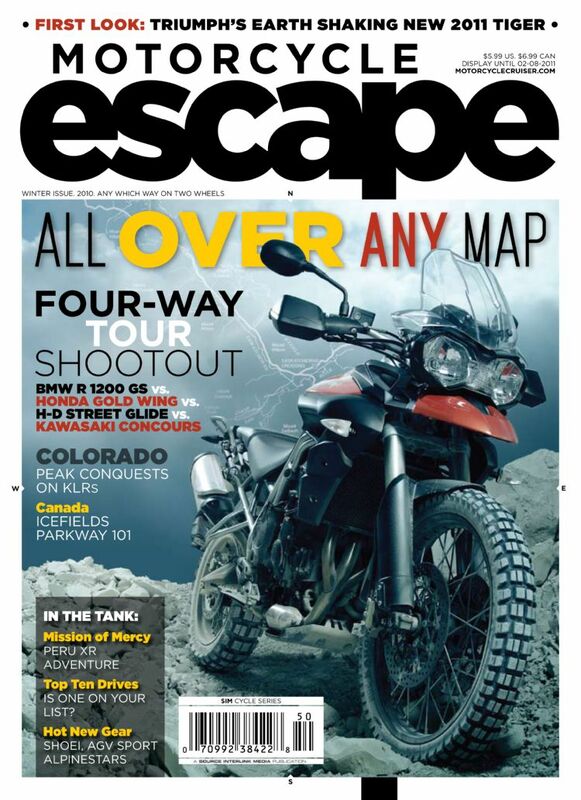 Originally launched in 2004 as a touring magazine, Motorcycle Escape featured unique content that encouraged and enabled readers to follow through on their travel passion. We haven’t skimped on the package this time either—you’ll find the same high-end production values and bold, personable stories, tests and reviews, with a focus on unique, bike-worthy destinations and the people that ride there. Motorcycle Escape is about adventure—not just the ride. Edited by Andrew Cherney, with help from fellow original Escapees Jamie Elvidge and Marc Cook, along with a veteran team of moto-journalists, photographers and art directors (take a bow, Darren Scott), the Winter issue of Escape is available on newsstands November 18th. December issue of Adventure Motorcycle is out. Go get it! Pack space is always at a premium on your bike. Up until now all sleeping pads have been pretty much the same except for thickness. Now Klymit brings an ultra light ultra compactable design. See ﻿﻿﻿﻿www.Klymit.com for more info or click the image. Hooray! More room for snacks in the saddle bags now. You are currently browsing the Minnesota Adventure Riders blog archives for December, 2010.